A museum was added to the village in 1990 and a research center was added in 2002, both financed by grants from the Clara Blackford - W. Aubrey Smith Foundation. Here are housed many interesting and historic items, including portraits of outstanding civic leaders painted by Mrs. Russell Hanna a number of years ago. 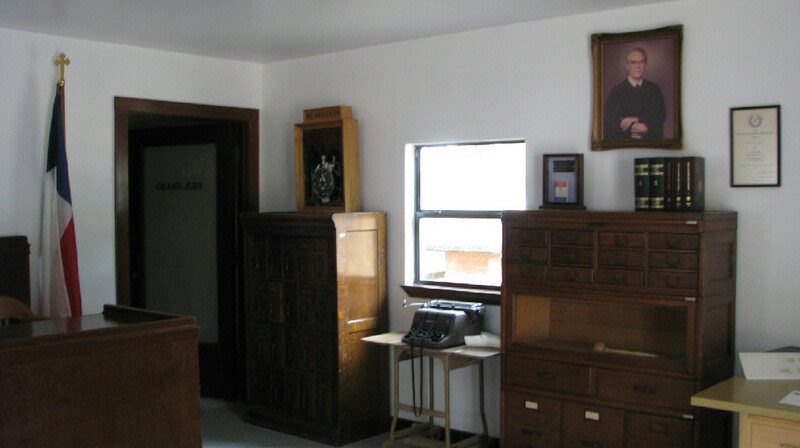 One of our most recent additions to the research room is the office of 15th District Judge Retired R.C. Vaughan. The furnishings are on loan from Grayson County and Judge Vaughan’s papers are in files for research by individuals. We’ve also added a digital library that contains obituaries, scanned early day newspapers and other historical information for use as research sources. Shelves of historical volumes can be found in the Research room. It is a genealogist's dream-come-true. Grayson County still contributes to the upkeep, as does the Old Settler’s Association of Grayson County. Other funding comes from grants for special projects, memberships and small admission fees. Also, booklets about the structures in the village and other history of the county were put together by John and Mary Crawford and are offered for sale along with a few souvenirs to raise funds. We also hold community activities to help support the village. Grayson County Historical Society meets the Second Tuesday of Each Month at 6:30 p.m. in the R.C. Vaughan Community Room. Thors Society (Texoma Herb & Old Rose Society) meets the Fourth Saturday of Each Month at 10 a.m. in the R.C. Vaughan Community Room. or contact us via the webpage.